The father of Fabinho has revealed that talks are ongoing with Arsenal, Manchester United, Manchester City and Barcelona over a possible move for his son. He stated while speaking on a French TV show that the Monaco midfielder is on the verge of making a transfer from the club with negotiations with top clubs still in progress. 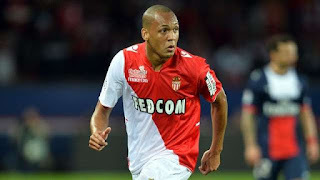 He however admitted that of all the four clubs interested in Fabinho, Manchester City look to be favourites for his signature. “We have been in talks with Manchester United, Manchester City, Arsenal & approached by Barcelona. The 23-year-old who has been in nice form for Monaco has scored seven goals and provided three assists so far this season. He has established himself as a regular since joining from Real Madrid in 2013 and has four senior caps for the Brazilian national team. Fabinho spent his debut season and the next on loan at Monaco before penning a permanent deal in the summer of 2015.